Although we don’t normally venture out on the weekends, today held a special reason, actually two, to lure us out of the comfort of our beautiful home. It was a beautiful spring-like day with sunshine and temperatures in the mid to upper 70’s. The first event, an arts and crafts show downtown by the library, was interesting; there were many vendors of jewelry, clothing, pottery, knick knacks, books and other stuff. We looked around a bit and Verna bought a decorative screen cover for a wine glass to keep the bugs or falling debris out. We didn’t stay too long, just enough time to look at all the booths. The other event was our Annual Bluegrass Festival. There were several bands that we listened to, all of which were very good performers. 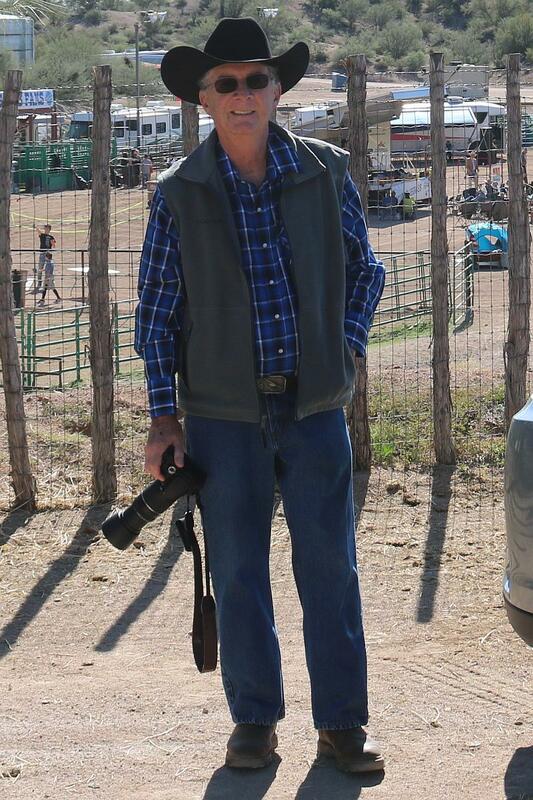 We also browsed the vendors up at the Rodeo Grounds where the event was being held. I bought a souvenir T-Shirt commemorating this year’s Festival. 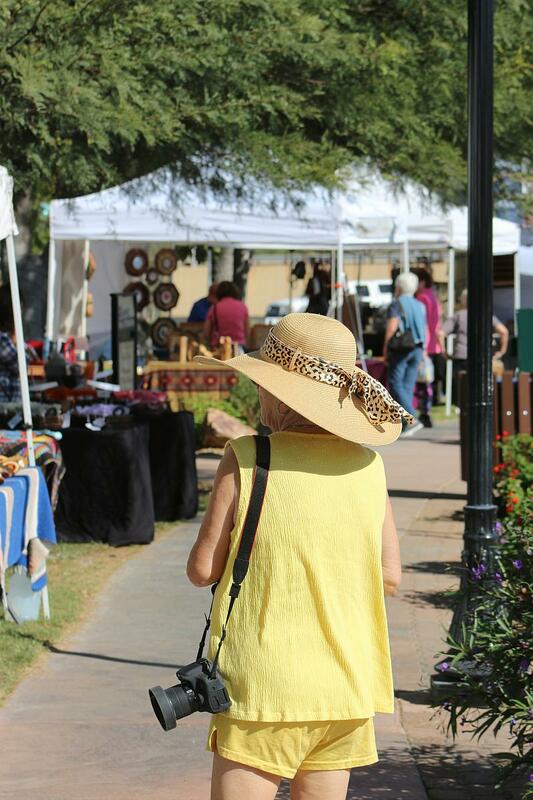 Photos of me in my new cowboy hat at the rodeo grounds and of Verna browsing at the craft fair. Click on either image to enlarge. 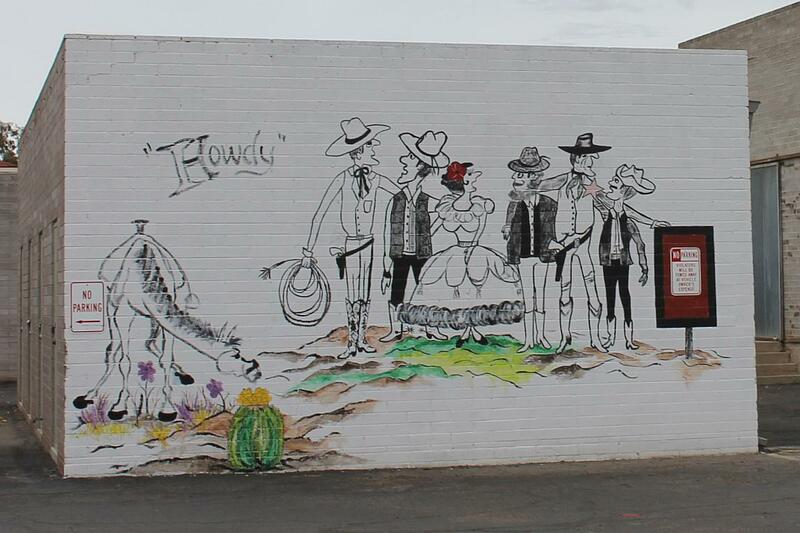 This wall art on a building on Frontier Street just east of the Yavapai Street Railroad crossing is just one of the many interesting things to see in Wickenburg. The caption is “HOWDY,” and depicts cartoon caricatures of a horse, some six-shooter packing cowboys (one with a lasso), a lady and a couple of other townfolk. Although they are cartoons, they are not too far fetched from what you might expect to see in town during roping season which is currently underway. I took the photo this afternoon when we were on our way to the clinic for a medical test (nothing serious). Click on the image to enlarge. 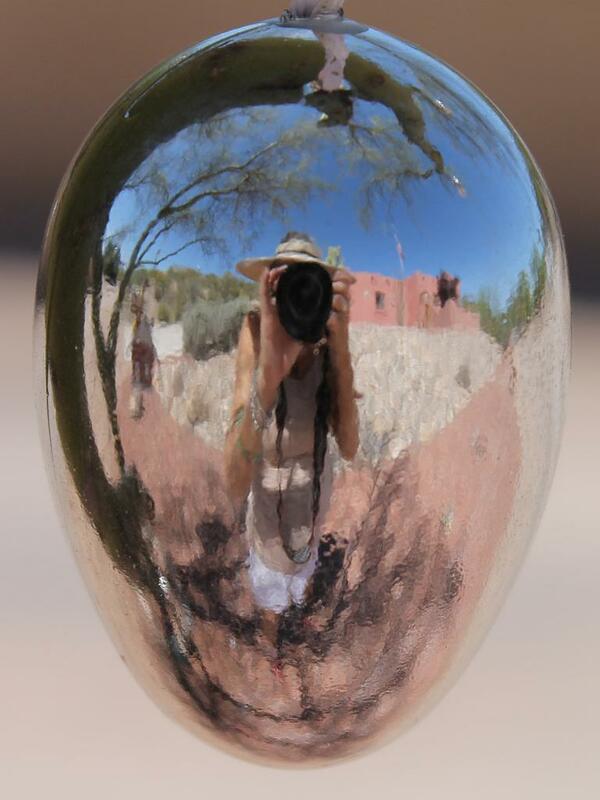 A while back, I bought a bunch of silver egg-shaped decorations which I hung out on the palo verde tree in front of the house for the Easter holiday season. I was going down to the road to take pictures of a couple of hedgehog flowers that opened today and I paused long enough to take this photo of one of the eggs which turned out to be a self-portrait of me and my camera. Click on the image to enlarge. We were doing a little last-minute shopping down in the touristy part of town today. 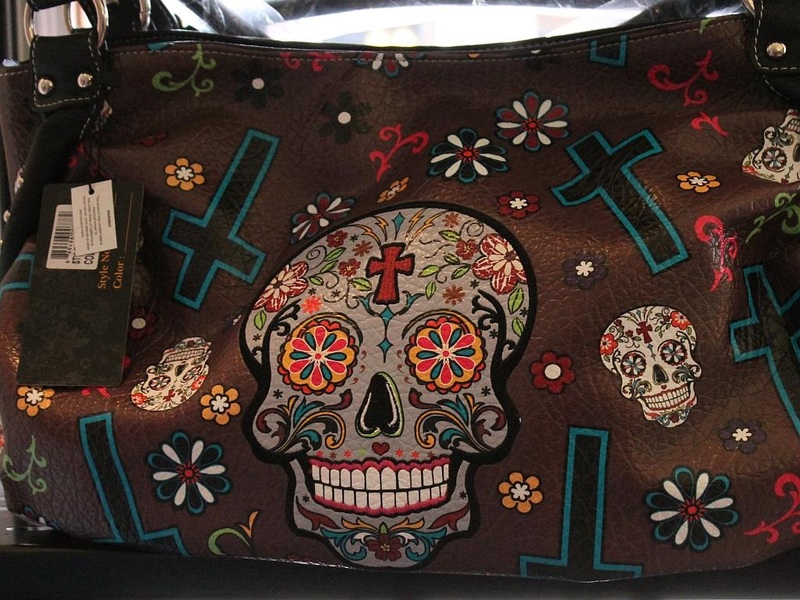 We saw, but did not buy, this nice handbag featuring “Day of the Dead” (Día de Muertos) imagery. Click on the image to enlarge. We were shopping for another person (my daughter-in-law) with Christmas Eve as a birthday. We finally settled on a nice hand-made shawl for her. We shipped it 2-day USPS today, so it should be there in time. 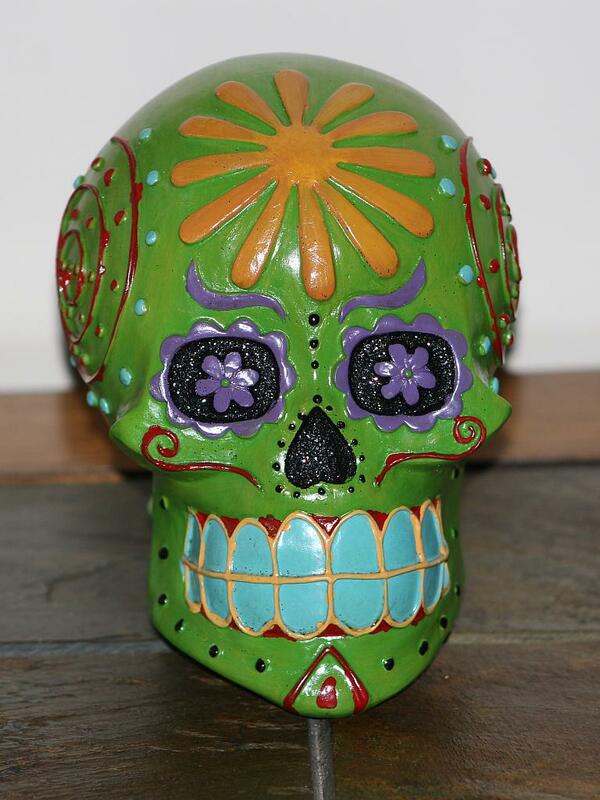 We bought this nice Sugar Skull decoration in a post-Halloween bargain pile at one of the supermarkets here in town. Other than a Halloween decoration, this could be used to celebrate “Dias de Los Muertos” or Days of the Dead that starts on October 31st through November 3rd to coincide with Halloween and All Saints Day celebrations. The alliteration in the title refers to the Conestoga seen in the image above. 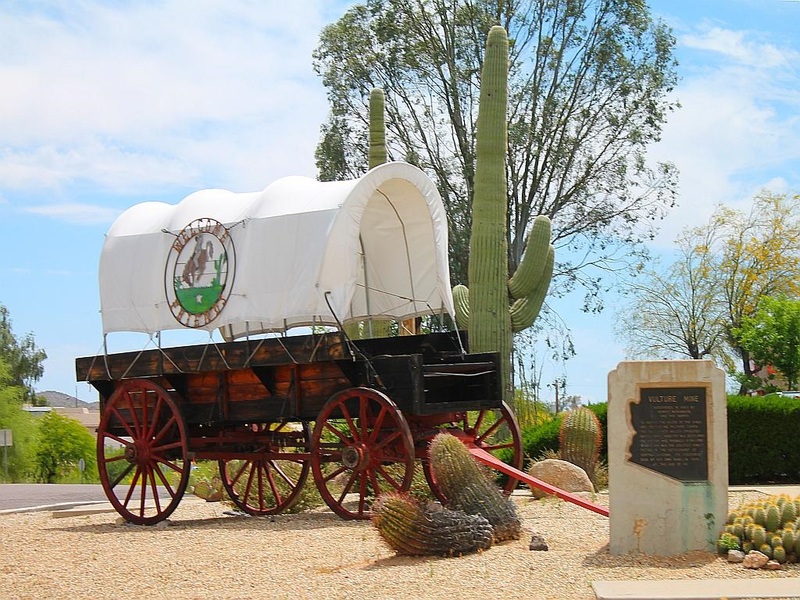 The wagon, along with an Arizona State Historical Marker sit on the southwest corner of the intersection of US 60 and Vulture Mine Road. Click on the image to enlarge. The marker is dedicated to Vulture Mine which is about 13 miles south of it along Vulture Mine Road. The wagon is used to welcome visitors to town and is often decked out with a banner advertizing this or that event. Last summer, the wagon was blown over and the cover ripped to shreds by a violent microburst thunderstorm. We are happy that the town and the ‘powers that be’ have restored the wagon to even better than it was before the storm. Bob gave me these old photos of him taken thirty-some years ago, so I could send them up to one of the social media sites as a ‘throwback.’ In the image above, the cowboy dude on the left was actually an urban cowboy while John Travolta was still having Saturday Night Fever. 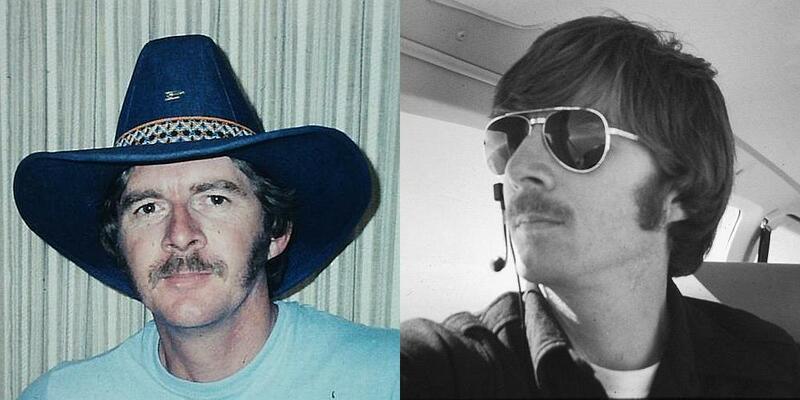 The guy in the right side of the image was acting as pilot in command of one of a fleet of aircraft at the flight school where he instructed and did charter flights. Click on the composite image to enlarge.